In 1938 Aileen married Carroll Verne Cahan. A serious scrolling through the Seattle Times and PI did not reveal Aileen’s marriage announcement. I was frustrated because Aileen was very much into the etiquette of things. However among the collection of photographs and memorabilia I received from my cousin I found the wedding reception and newspaper announcement. Marjorie, her sister, was her maid of honor and she also signed the Marriage License. 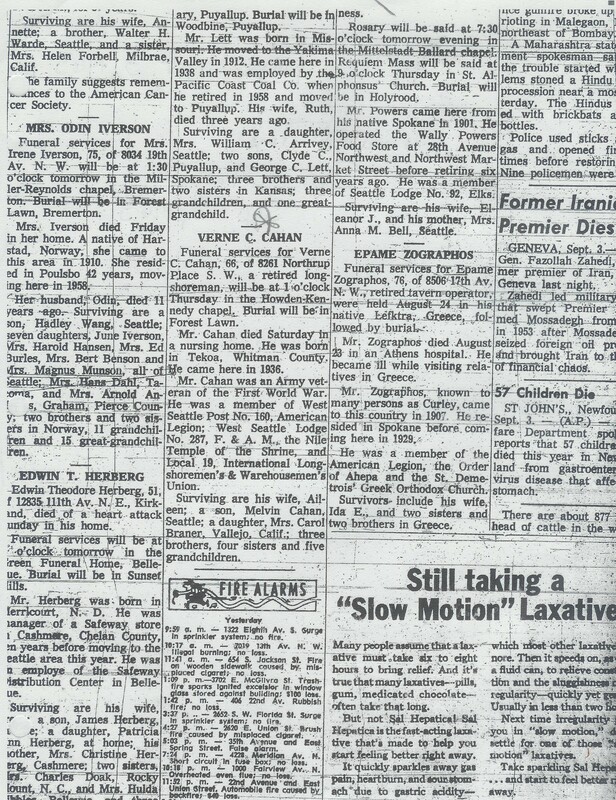 The announcement appeared in the Seattle Times March 18, 1938. The marriage of Miss Hazel Aileen Boardman, daughter of Mr. and Mrs. Robert Boardman, and Mr. Carol Verne Cahan, son of Mrs. Lola Cahan, was solemnized last evening at the West Seattle Christian Church with the Rev. C. M. Ridenour officiating. Miss Marjorie Boardman was her sister’s maid of honor, and Mr. Frank Flanery acted as best man. 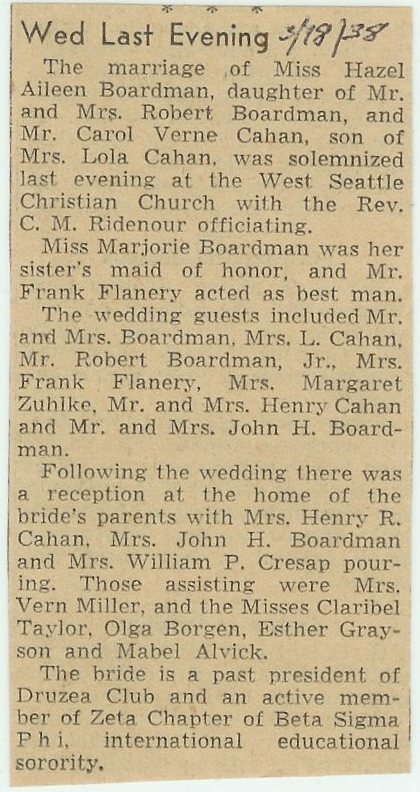 The wedding guests included Mr. and Mrs. Boardman, Mrs. L. Cahan, Mr. Robert Boardman, Jr., Mrs. Frank Flanery, Mrs. Margaret Zuhlke, Mr. and Mrs. Henry Cahan and Mr. and Mrs. John H. Boardman. Following the wedding there was a reception at the home of the bride’s parents with Mrs. Henry R. Cahan, Mrs. John H. Boardman and Mrs. William P. Cresap pouring. Those assisting were Mrs. Vern MIller and the Misses Claribel Taylor, Olga Borgen, Esther Grayson and Mabel Alvick. The bride is a past president of the Druzea Club and an active member of the Zeta Chapter of Beta Sigma Phi, international educational sorority. Marriage Certificate #48960, County of King, Minister of the Gospel by authority of the license bearing the date of 18th March 1938 at the West Seattle Christian Church, 4400 42nd Ave. S.W., Seattle, WA… join in Lawful Wedlock Verne C. Cahan of the county of King and Hazel A. Boardman of the county of King…in the presence of Frank L. Flanery and Marjorie Boardman on 18th March 1983. Signed by all, and Officiating Clergyman C W. Ridenour, 3833 40th Ave. SW, Seattle, WA. 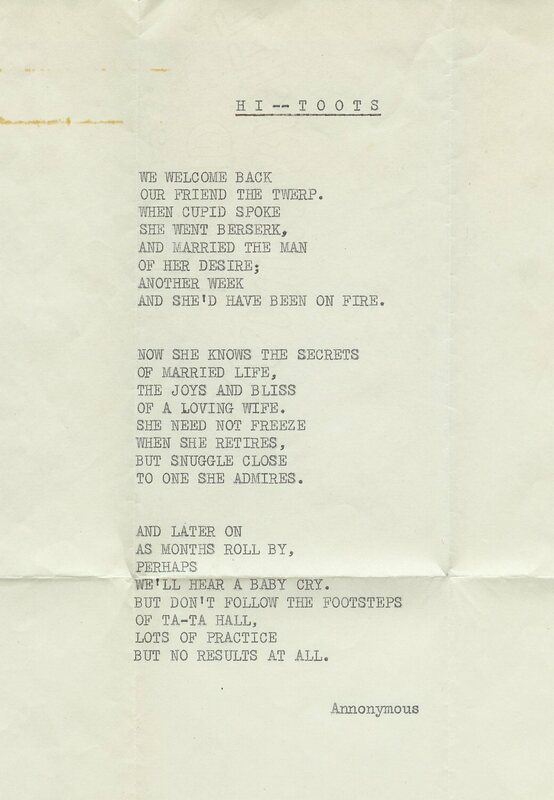 Someone wrote a poem that was among the memorabilia and signed it anonymous. Now my father Keith used the word “Toots” a lot, however, the nature of the poem sounds more like her friends were teasing her. 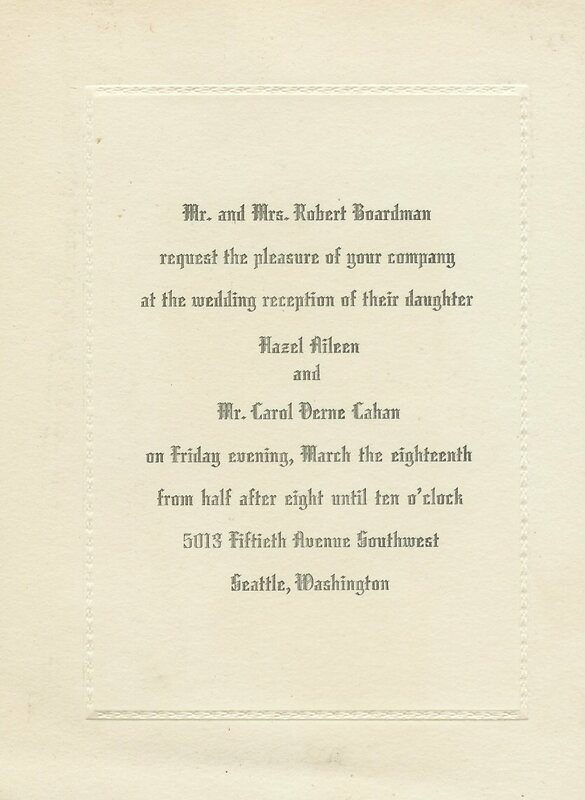 This entry was posted in Aileen Boardman, BOARDMAN Surname, Cahan surname, King County, Marjorie Boardman, Robert and Ethel Boardman, Seattle, Washington and tagged Druzea Club, Marriages at the King County Administration Bldg., Wedding in 1938 on January 2, 2014 by BJ MacDonald. Aileen the Socialite – Druzea Club! 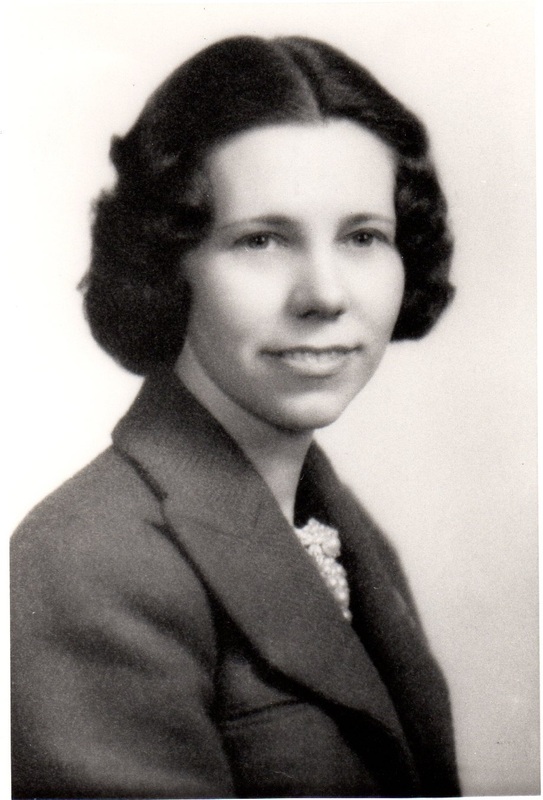 Aileen, the oldest of the Boardman children, was busy in the 1930’s. She was a member of the Druzea Club. I tried to learn more about this club and its purpose but didn’t find anything with a quick Google search. As you review the articles below you will get and idea of its purpose. Its first program dance of the season, a “snow dance,” will be given by Druzea Club Friday evening at Trinity Parish House, Eighth Avenue and James Street. Jackie Evans, recently returned from a dancing tour which included A Century of Progress Exposition, will entertain during the intermission. Miss Lucille Stone is chairman, assisted by Misses Aileen Boardman, Blanche Ashton, Esther Shelberg, Helen Croan, Alma Pearson and Mrs. Raymond Canedy. Patrons and patronnesses will be the Rev. and Mrs. C. Stanley Mook, Dr. and Mrs. Ira L. Neill, Mr and Mrs. Frank Richardson Pierce, Mr. and Mrs. Paul Graves and Mr. and Mrs. R.C. 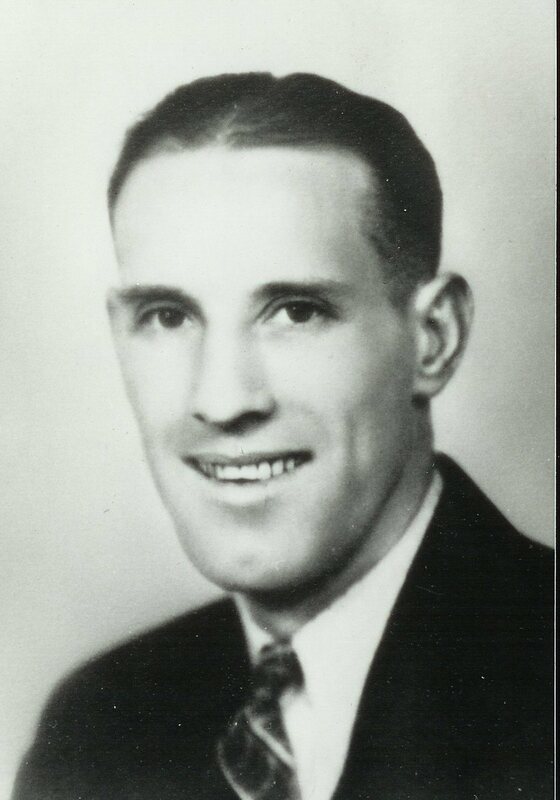 Dillingham. Miss Aileen Boardman is in charge of the “Shanghai New Year Dance” to be given by the Druzea Club today at Trinity Parish House (Lynch Photo, PI Staff). Druzea Society Giving Function: The Druzea Club will entertain with a Shanghai New Year dance this evening at Trinity Parish House, 8th Ave. and James St. Miss Aileen Boardman is in charge of the dance and is being assisted by Miss Lucille Stone, vice chairman; Miss Blanche Ashton, Miss Marguerite McPherson, Miss Nellie Fox, Miss Alma Pearson, Miss Jean Lachore, Miss Alice Carter, Miss Norma Goddard, Miss Josephine Goddard, Miss Martha Person and Mrs. Jack Oflock. A Chinese New Year program will be given during the intermission. Patrons and patronesses include the Rev. and Mrs. C. Stanley Mook, Dr. and Mrs. Ira. L. Neill, Mr. and Mrs. Paul Graves, Mr. and Mrs. R. C. Dillingham and Mr.and Mrs. Ben Graham. A costume dance called “Cupid’s Parade,” in which the best dressed man and woman will be given awards, will be given by the Druzea Club of Trinity Parish Church this evening at 9 o’clock in the parish house, Eighth Avenue and James Street. Patrons and patronesses for the evening will be the Rev. 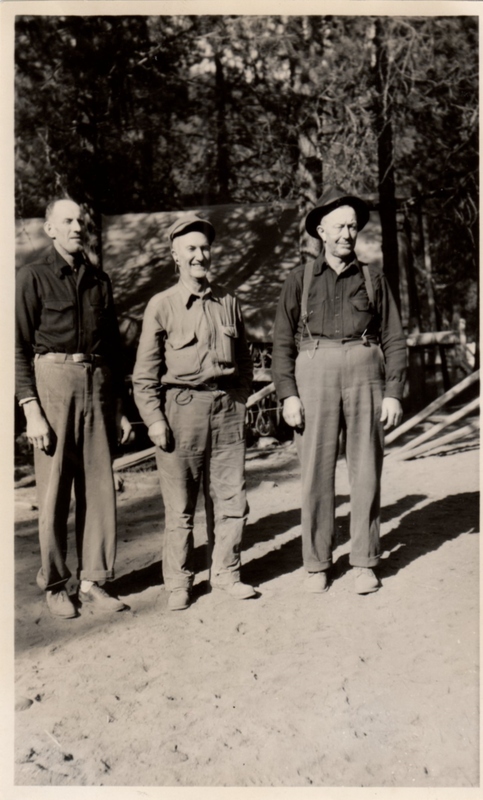 C. Stanley Mook and Mrs. Mook, Mr. and Mrs. Ben Graham, Mr. and Mrs. J.E. Butler, Mr. Robert Gentry and Mr. and Mrs. George Wheeler, Miss Lucille Stone, chairman of the social committee, is assisted in the arrangements by the Misses Nellie Fox, Alma Pearson, Martha Pearson, Aileen Boardman, Gladys Canedy, Helen Croan, Jessie Oflock and Norman Goddard. The Misses Patty Merrifield, Thelma Ridley, Muriel Rouse and Mary Lou Hoyt will present a “Flirtation Dance” and Miss Beverly Wilson will appear in “Cupid’s Dance.” Supper will be served at the close of the evening. From 3 to 5 o’clock this afternoon, the members of the Druzea Club will entertain with a musicale tea in the Trinity Parish House. Proceeds from the afternoon will go toward the club’s welfare project, care of an orphan girl, Martha Carlos of Fort Yukon, Alaska. Presiding at the tea table will be Mrs. Beatrice Wheeler, Mrs. Charles Stanley Mook, Mrs. S. Arthur Huston and Mrs. F.E. Robinson. During the receiving hours there will be a program featured by voice and harp selections, by Ruth Osborne; vocal numbers by Gordon Neal, Floyd Murphy, Annie Olson, Lucille Stone and Jean Lochore; piano selections by Phyllis Clark and Martha Grant; violin numbers by Jeannette Mackie and by a violin trio by including Jeannette Mackie, Phyllis Olson and Elizabeth Waldo. Serving on the Committee of arrangements are Marguerite Robertson, chairman; Helen Croan, Audrey Stocks, Greta Bushnell, Alma Pearson, Theresa Campbell, Lillian Ellingsen, Florence Engstrom, Vera Freelund, Helen Corner, Dorothy Justan and Frances Lively. The Druzea Club the name is Russian meaning “Friendly,” is composed of business girls between the ages of 18 and 35, the membership being limited to 150. The club meets at the Trinity Parish House each Tuesday evening during the school year for dinner, which is followed by classes in contract bridge, charm, dramatics, needlework, tap dancing, basketball, badminton and lessons in horseback riding are also included in the curricula. The club which is open to all denominations, ahs a lodge (built in 1932) at Lake Kilarny. Miss May Brosslos is president of the club, retiring from office next month; Miss Gladys Underwood is vice president; Mis Beth Kay, secretary; Miss Alma Pearson, treasurer; Miss Signe Wignaness, assistant treasurer, and Miss Evelyn Carlquist, corresponding secretary, Committee Chairman are Esther Shelberg, athletics; Martha Pearson, bulletins; Charlotte Harris, church and social service; Nellie Fox decorations; Jean Lochore, dinners; Lolabel Fritz, fellowship; Charlotte Bunde, lodge; Fayle Coulson, membership; Aileen Boardman, program; Margaret Benedict, publicity; Lucille Stone, social; Gladys Underwood, classes; Roberta Wheeler, music; Virginia Chapman, custodian; Martha Blanche Ryan, Martha…. (it stops). 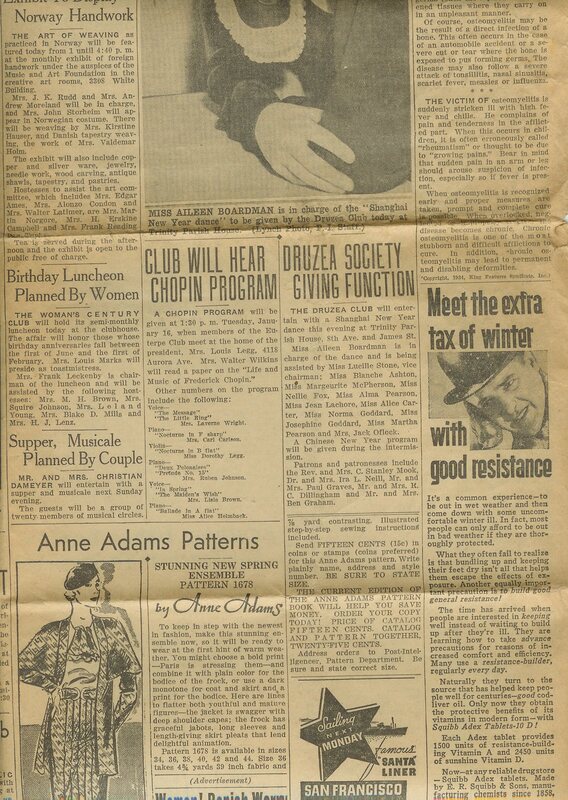 The Seattle Daily Times featured on Tuesday, March 12, 1935 another Druzea Club article. Aileen becomes the President. Druzea Club will present a program of music and drama Friday evening at 8:15 o’clock in Trinity Parish Hall under the leadership of Marie K. Brower, Helen D. Davis and Jean Chapman accompanist. The program will include carols in which the audience will join selections by a string trio composed of Virginia Chapman, piano; May Brossols, violin; Betty Sands, cello; numbers by a quartet composed of Dorothy Bernier, Mary Pease, Mazine Eyler, and Jean Leslie, and several numbers by the club chorus. The cast of the play includes Nancy Williamson, Charlotte Harris, Aileen Boardman and Lydia Schultz. A silver offering will be taken at the close of the program. This following news article was among the pictures and memorabilia I received from my cousin but it does not give a date. I have assumed it was probably close to about 1936. It would seem that her term as President would be about a year? Aileen is held in high esteem and fetted about 1936? Photo and Caption: Miss Aileen Boardman, new president of the Druzea Club, who will be honored at the inaugural ball on Saturday. Group Leader to Be Feted – In a setting of spring blossoms, new officers of the Druzea Club will be honored at the annual inaugural ball to be held in the D.A. R. House Saturday. The new officers are Miss Aileen Boardman, President; Mrs. Jack Avey, vice president; Miss Ethel Grayson, secretary, and Miss Alma Pearson, treasurer. 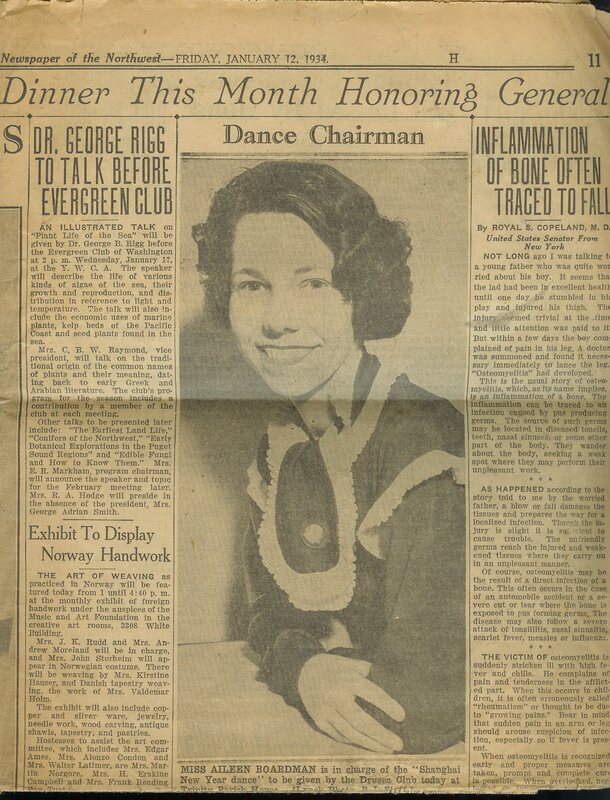 Miss Bernice Pearson, chairman of the dance committee, is assisted by Miss Evelyn Peterson, Miss Maxine Morrow, Miss Gladys Brown and Mrs. Charles Anderson. Patron and patronesses are Bishop and Mrs. F. Arthur Houston, Mr. and Mrs. E.F. Colcock, Mr. and Mrs. W. P. Cresap, Mr. and Mrs. O. Engstrom. 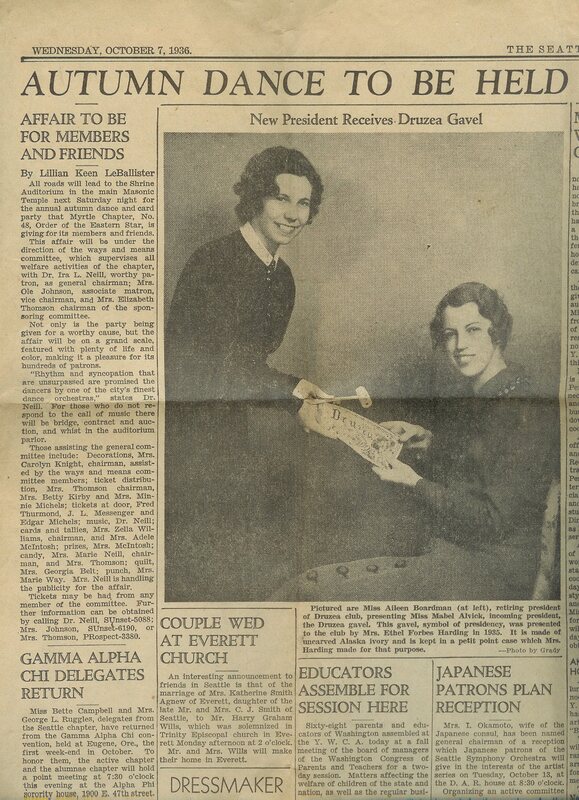 In this next article Aileen is featured in a photograph giving over the gavel to the new Druzea President Mabel Alvick. The article is dated Wednesday, October 7, 1936. 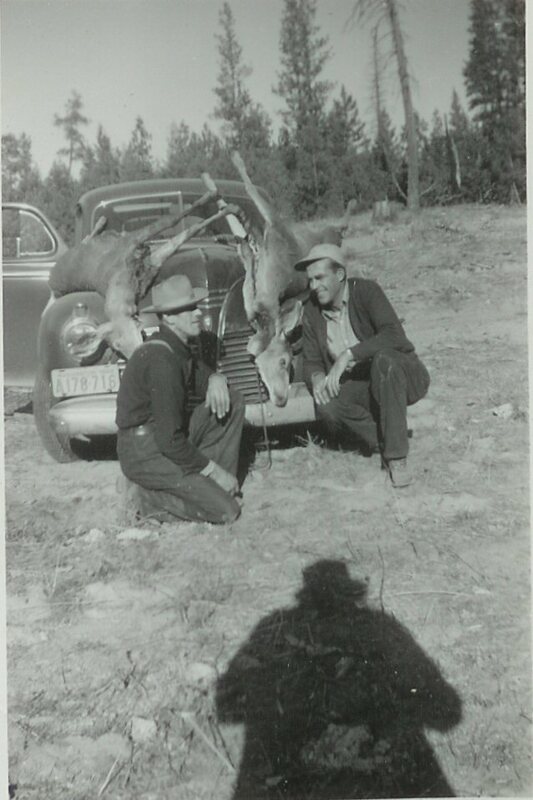 The picture and captions were all that was found among the pictures and memorabilia given to me. It is a great photo of my Aunt. My Aunt Aileen was little and probably came up to about 5 ft and didn’t weigh much. Aileen steps down as President 1938. This looks like it was a lot of fun and a lot of work planning all these events. I wish I knew that she was involved with this club it would have been fun to hear her stories about it all. 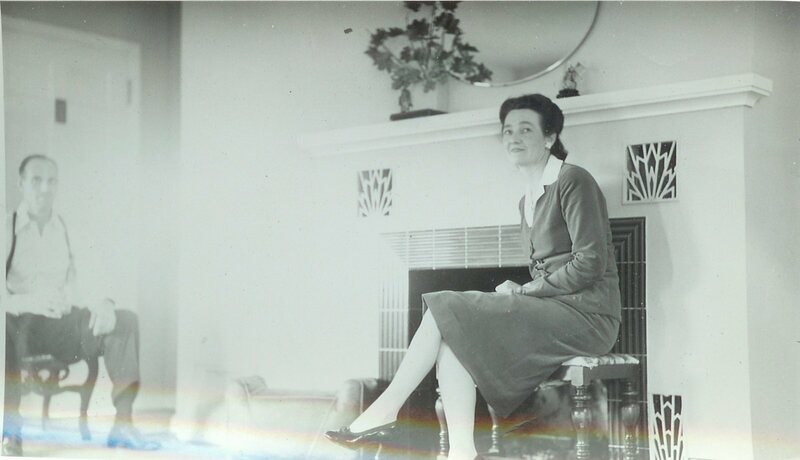 This entry was posted in Aileen Boardman, BOARDMAN Surname, King County, Seattle, Washington and tagged Druzea Club, Shanghai New Year Dance 1934, Snow Dance, West Seattle on December 17, 2013 by BJ MacDonald. Robert Brown Boardman, or my Uncle Boardie, appears in the West Seattle High School yearbook for the year 1932 as a Sophomore. He is featured on the following page of the yearbook with his name in the list under Bob Boardman. On the right are the group photos of the students in the class. My uncle is starting to look more like the man I knew. I think that the boy sitting in the front row in the second picture about four people over from the right in the white sweater is Robert Brown Boardman, my uncle an Aileen and Marjorie’s little brother. 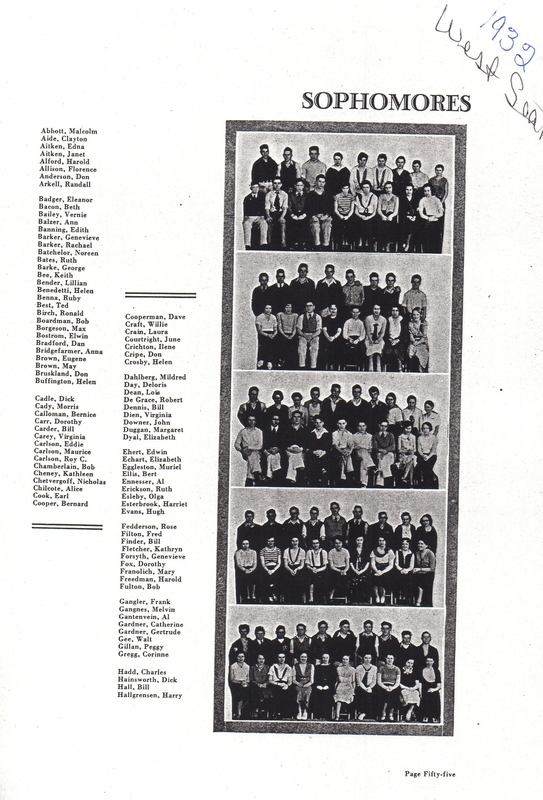 I could not find Uncle Boardie in the Freshman and Senior year of the yearbooks for West Seattle. I do have a photograph of him that looks very much like a graduation photograph. My calculations have him graduating in 1934?  However, I do not have a graduation certificate for him, so I don’t know for sure if he did or didn’t graduate. I guess I should put that on my to-do list to get from the Seattle School Archives. Boardie’s High School Graduation Pic? 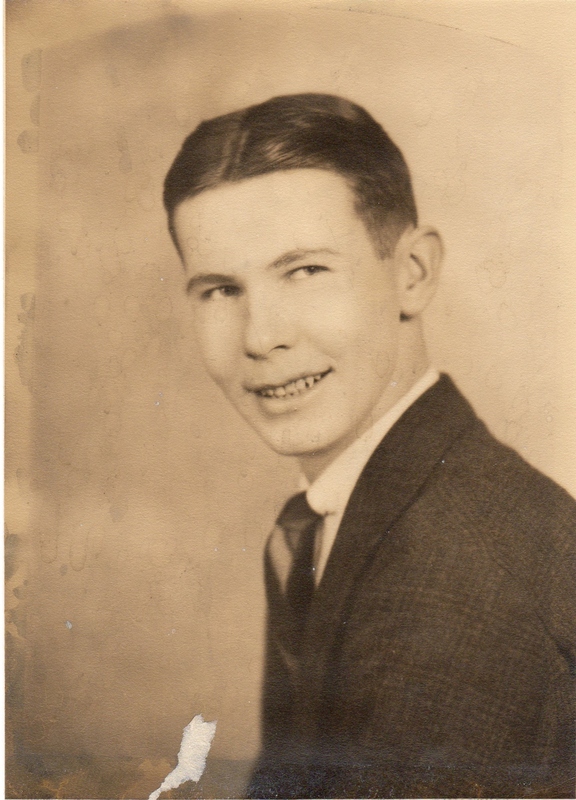 This entry was posted in Aileen Boardman, BOARDMAN Surname, Marjorie Boardman, Robert Brown Boardman (Uncle Boardie), Seattle, United States, Washington, Washington and tagged High School graduation, West Seattle High on October 22, 2013 by BJ MacDonald.